I have followed Karen Giron's blog for awhile, she's a very talented lady and Stampin Up has now acknowledged her. How wonderful, and congrats Karen if you read this. Hop over to her blog and read about her success. Supplies:Vanilla Card Blank 4" X 5 1/2" Halcraft, papers from my stash, Stamps: Inkadinkado-97734 Warm Holiday Wishes, CTMH-C1291 Gift of Love, Cuttlebug embossing folder-Textile, Inks: VersaMark ink pad, CTMH-Z2127 Holiday Red, Z2121 Garnet, Stampin Up-clear embossing powder, Sharpie Poster Paint Pen-gold, CTMH marker-cranberry, mini red heart sticker, ribbon-Offray, small gold brad, pop dots. Your card is beautiful! 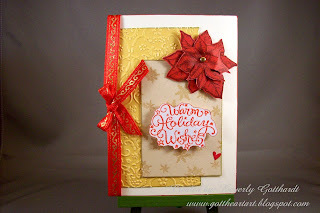 I love the textures on your card and the embossing on the poinsettia looks really nice. Thanks for joining us in this week's Tuesday Throwdown! Love the theme! Glad you participated in the challenge this week at Sherrod Studio! Your card is very pretty and I especially love the ribbon! Thanks for playing along with Sherrod Studio!